John McCain is attempting to salvage his foundering campaign with the debut of a new advertisement. Three weeks before Election Day, Sen. John McCain (R-Ariz.) on Monday is unveiling what his aides call a more forceful new stump speech in which he portrays himself as a scrappy fighter on the comeback trail against an opponent who’s already “measuring the drapes” in the Oval Office. Allies are calling this “hitting the ‘reset’ button” on the campaign, with McCain reemerging after a long Sunday strategy session with a feisty tack that uses candor and humor, at a time when his rallies have become known for raucous rage and clumsy attacks. But it’s more like hitting the panic button. McCain is appearing Monday in Virginia and North Carolina – two states that are usually safe for Republicans in presidential races, and that he should have put away long ago. But Sen. Barack Obama (D-Ill.) is pouring visits and staff into the former Confederacy, and he has caught McCain in many Southern polls. Nationally, the Real Clear Politics average has Obama up 7.3 points. A Washington Post-ABC News Poll out Monday morning gives Obama a yawning 10-point lead, which a Reuters/C-SPAN/Zogby poll shows Obama up just four points. 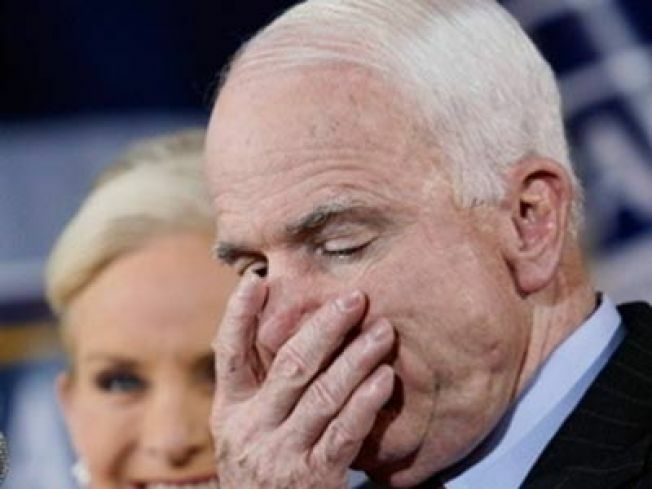 The remarks reflect the graceful cadences of Mark Salter, McCain’s longtime aide and co-author, and suggest that the senator plans to fight without personally going viciously negative in the final days. He can leave that to the television advertisements. The reference to House Speaker Nancy Pelosi (D-Calif.) and Senate Majority Leader Harry Reid (D-Nev.) is part of a new Republican effort to warn voters of the consequences of having on party dominate all of Washington, as Democrats would if Obama won in a landslide that helped his party rack up wider congressional margins. Over the weekend, McCain advisers said he planned to announce new economic policies, including tax cuts designed to encourage investors to return to the markets. But after a tense strategy meeting on Sunday, McCain had not signed off on any new announcements, to the consternation of some key supporters who said he needs to do more to show command on the economy, the top issue on voters’ minds. The third and final presidential debate is Wednesday at Hofstra University, the largest public school on Long Island, N.Y. After that high-stakes encounter moderated by Bob Schieffer of CBS News, McCain’s changes of changing the dynamics of the race fall off a cliff.